So it was still our second day in sunny Sydney and despite the effects of the damage inflicted by the sun and the not so caring partner (Aloe Vera in the freezer? What's that all about?) we still managed a fairly normal-ish kind of day wrapped up in front of the telly watching a funny film from good old Blighty carefully interspersed with far too many advertisements. Most of that day was spent in the confines of our Travelodge hotel room as the sunburn had severely impaired our outside faring capacities through fear of being burnt again and an abstract terror of being taken too far away from the cooling effects of the not nearly quite big enough bath tub. 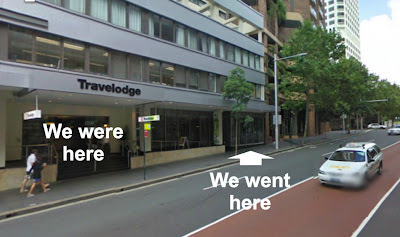 We did however strive to leave the hotel in one last ditch effort to explore Sydney by night again in so far as we went all the way next door to the hotel. A journey consisting of at least 50 paces and an elevator ride down 12 floor levels. It could have been more I suppose, but that would have been a whole nother storey. Anyway, we quickly made the journey, sat and ate our Japanese meal out in the street, and quickly rushed back indoors like vampires escaping the rising sun. I knew that Twilight saga was a lot more than it was made out to be. This was to be our last night in Sydney as we were to be out of the Hotel by morning and we fully intended to pack our bags when we returned from the day's extensive journeying. But we didn't. We just ate our fill, struggled to negotiate the 15 second journey back to the hotel, arrived at our room like someone trapped in a desert arriving at an oasis, collapsed on our bed and promptly slept for the rest of the night. The following morning we arose in time for an unhurried packing session, express checkout, and a massive bundling of stuff into the car before finally leaving the hotel carpark and saying goodbye to Sydney one last time. Although we hadn't done much there, we still thought we had done enough to do the place justice. Any longer there and it would probably have just been another any old city, any old place. But somehow it managed to treat us to just enough touristy stuff to retain it's mystery and magic.